Philadelphia Eagles quarterback Carson Wentz scrambles during last season's matchup against the New York Giants at Lincoln Financial Field. What is the line telling you: The Eagles look to be in big trouble. They were a 9-to-10-win team and it reached 10.5 before the start of the season when they were healthy. Since then, they’ve been devastated by injuries on both sides of the ball, which has caused some finger-pointing and dissent in the locker room. That’s never a good thing. With that said, it’s going to be a battle to finish 8-8. The sad part is, 8-8 could actually win the NFC East this year. The bookmakers opened the banged 4-6 Eagles as a 4.5-point favorite over the 3-7 Giants, with a combined total of 46.5. The sharp money immediately attacked the screen early and often, which forced a move 1.5-point, with the Eagles now a 6-point favorite. Keep in mind, there is always an early-week market manipulation. The sportsbooks are showing a top-heavy count with the Eagles getting 60-percent of the action. It is a division game with the Giants having revenge on their minds, after being blown out earlier this season. The Giants arrive in South Philly with two-straight wins against the banged-up Eagles, who signing guys off the street. 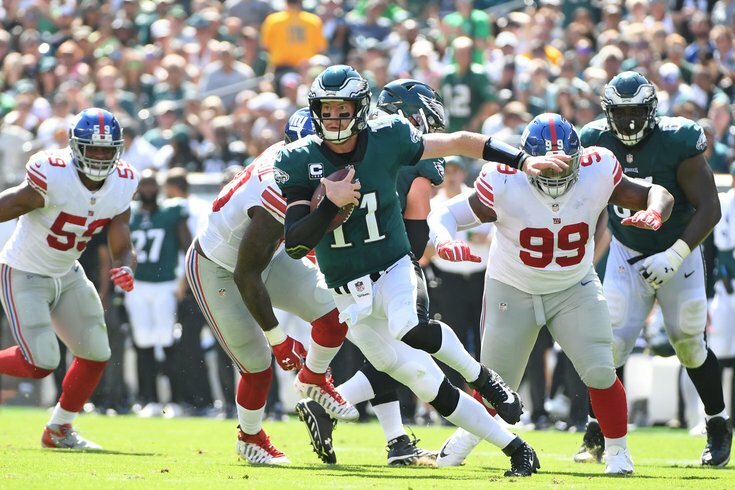 The sad reality is the Giants’ offense is ranked 11 spots higher than the Eagles in yards per play and four spots higher in overall offensive efficiency. Bottom line: The smart money likes the over. What is the line telling you: The Panthers have lost two in a row are fighting for their playoff lives. Oddsmakers and offshore sports books opened this game with the 6-4 Panthers being a small 3-point home favorite over the 5-5 Seahawks with a combined total of 47. Right away, the influx of early money liked the Panthers, which forced the line to 4 in some books. The wise guys liked the Seahawks plus-4, which forced bookmakers to readjust their price to 3.5, where it currently sits. Whispers from behind the counter are saying there is 50-50 split on all tickets placed. The sharp money is leaning toward Seattle, because they’ve played the better competition and have been more consistent throughout the year. The Seahawks have the overall better point differential and passing efficiency on offense. On defense, Seattle ranks 15 spots higher in overall defensive efficiency and 10 positions better in the pass-rushing department. The Panthers’ pass rush ranks in the NFL basement. The average fan can even tell you if you can’t pressure on Russell Wilson, he’ll make you pay dearly. Bottom line: The smart money likes the Seahawks plus-3.5 and the under. What is the line telling you: Offshore juggernaut Pinnacle Sports opened this game with the Vikings minus-2.5 at U.S. Bank Stadium with the total set at 47.5. Since then, we’ve seen minimal movement on a side, but did see a 1-point move toward the Vikings. Early market reports offshore show 70-percent of all tickets punched are on the Packers, along with 65-percent of the overall money waged. The public and the wise guys are on Green Bay here. The last time these two teams played, the game ended in a tie. This game should be close, as well. Green Bay, regardless of its 4-5 record, still rank 10 spots higher in yards per play and average 24 more yards rushing per game. The Packers have the slightly better passing numbers. On the defensive side, for how good the Vikings have looked, they’ve only let up 0.3 yards per play than the Packers. The Packers actually have the better pass rush. They’re ranked third, and the Vikings right behind, ranked fifth. This game is basically a coin flip, but anytime you’re getting points, you have to take the points here. Bottom line: The smart money likes the Packers plus-3.5 and 160 on the moneyline, plus the under.